Light summery fruity ice cream laced with just a hint of chocolate. What could be better than that! Yep, I’m ready for Summer after an unusually cold winter in the South. I was trying to find something to do with leftover strawberry pulp from making strawberry syrup. Ice cream with just a touch of chocolate sounded perfect! I’ve always been a dark chocolate fan. It’s so hard to find a corn-free version that I’ve given up on that and switched to full on 100% unsweetened chocolate. I’ve found that it’s so strong that you only need a little bit to feel indulged. You may have to add additional sweetener to whatever base you’re using to compensate, but I’ve come to prefer the rich flavor without all the sugar. In this recipe, the natural sweetness of the strawberries is more than enough for me. I like to use the smallest disher I have to scoop out several one inch diameter balls and pile them up in a dessert dish. Garnish with a couple of sliced strawberries and a dash of cacao nibs and you’ve got a party! This makes for an festive party presentation. Pre-scoop all the ice cream into small one inch balls onto a baking sheet and freeze. After completely frozen, store in a freezer zipper bag. Right before serving at your party, pile up ice cream balls in individual serving bowls and garnish. Light summery fruity ice cream laced with just a hint of chocolate. What could be better than that! Mix everything but grated chocolate in a high-speed blender. Pour into ice cream maker and chill according to the manufacturer’s instructions. Five minutes before the ice cream is done, pour in the grated chocolate. Empty finished ice cream in a freezer container and freeze for 2 hours before serving. To serve, scoop into bowls and garnish with sliced strawberries and cacao nibs. Let the ice cream thaw on the counter for about 15 minutes before scooping. For easier party serving, pre-scoop all the ice cream into small one inch balls onto a baking sheet and freeze. After completely frozen, store in a freezer zipper bag. 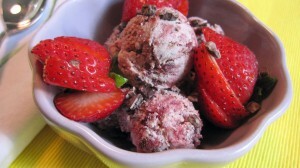 To serve, pull out as many ice cream balls as needed and garnish with sliced strawberries and cacao nibs. Check out my coconut sugar simple syrup. It’s an easy substitute for honey and agave. I shared this recipe on Natural Living, Live It Up, In and Out, Wellness Wednesday, Let’s Get Real, Real Food, Homemade Monday, Dare to Share, Recipe of the Week, Show Stopper, Simple Saturdays, Saturday Sparks, Think Pink, Five Friday Finds, Friday Foodie, Fancy This, Inspiration Spotlight, Anything Goes, Welcome to the Weekend, Best of the Weekend, Creative Collection, Savoring Saturdays, Try a New Recipe, Creative Exchange, Whole Food Friday, Inspire Us Thursday, Foodtastic Friday, Friday Frenzy, Fight Back Friday, Simple Meals, Real Food, Weekend No Rules, Healthy Vegan, Flaunt It, Friday Favorites, Show & Tell, Frugal Friday, Kitchen Fun & Crafty, Freedom Friday, Craft Frenzy, Foodie Friends, Eat Create Party, Inspire Me Please, Foodie Friday -2, Open House, Foodie Friday-1, Inspired Weekends, Flash Blog, Weekend Re-treat, Gluten Free Friday, Feathered Nest, Pennywise Platter, Doggone Dirty Craftin’, Homeacre Hop, Link Party, No Rules Weekend, Fabulously Frugal, Catch A Glimpse, Live Laugh Linky, Homestead Barn Hop, Create It Thursday, Wildly Original, Favorite Things, Full Plate Thursday, Project Stash, All Things, Tasty Tuesday -2, Mountain Woman Rendezvous, It’s a Party, Wicked Awesome, Recipe Round Up, Inspire Me Wednesday, What’s Cookin’, Whatever Goes, What I Learned, We Did It, WFMW, Wednesday Whatsits, Real Food Wednesday, Lovely Ladies Linky, Cast Party, Wake Up Wednesday, Wow Me, Delicious Dish, Wonderfully Creative, Wonderful Wednesday, Creative Muster, Whimsy Wednesday, Waste Not Want Not, The Yuck Stops Here, Wine’d Down, Allergy Free Wednesdays, Made by Me, From Dream to Reality, Show Me What Ya Got, Tutorial Tuesday, Too Cute, Tempting Tuesday, Wordless Wednesday, Anti-procrastination, Tuesday’s Table, Tuesday with a Twist, Tasty Tuesday, One Project at a Time, Take A Look, Hearth & Soul, Turn It Up, Totally Talented, Share Your Stuff, You’re Gonna Love It, Inspire Me Monday, Create Link Inspire, Inspire Me Tuesday, Tuesday Talent Show, Good Tips, Recipe Sharing, Handmade Tuesdays, Show Me What You Got, Two Cup Tuesday, Treasure Box, Fat Tuesday, Time to Sparkle, Made by You, Meal Planning, Thoughtful Spot, Mostly Homemade, What’s you Do This Weekend, Mad Skills, Happiness is Homemade, Sew Darn Crafty, Sweet Sharing, Much Ado About Monday, Melt in your Mouth, Motivation Monday, Round Tuit, Monday Funday, Recipe Round Up, Block Party, See Ya in the Gumbo, Simple Life Sunday, Mix It Up, Clever Chicks, Sunday Best, Inspiration Monday and Marvelous Mondays. This entry was posted in Desserts, Recipes and tagged chocolate, coconut milk, corn free, dairy free, dessert, egg free, refined sugar free, strawberry. Bookmark the permalink. The little ice cream balls make such a fun presentation. Love the party prep tip. I didn’t realize it was so difficult to find corn free dark chocolate. Thank you for sharing your dessert, tips, and info with See Ya in the Gumbo this week. Yep. “Grain sweetened” is code for corn. And just in time for the summer! We love everything strawberry! Love this! I’m so glad you linked this up to Motivation Monday. I need to do a round up of healthy strawberry recipes like yours because strawberry season is right around the corner here in the mid-Atlantic. This looks fantastic! The coconut flavor from the coconut milk must be great combined with strawberries! I’m stopping by from Good Tips Tuesday blog hop. Thanks for sharing this yummy recipe on The Yuck Stops Here this week! I love ice cream and really need to invest in an ice cream maker! In the mean time I’ll just have to sit here and wish there were tastable internet! You’ve been pinned and tweeted! I hope to see you again next week. You can find the party at Hot Momma’s Kitchen Chaos – http://mommasangelbaby.com every Tuesday from 8pm ET to Sunday at 8pm ET. HUGS! I had no idea there was corn in chocolate; what a bummer! I’m so glad you’ve been able to find a great way to still be able to enjoy it. This looks amazing! Strawberries and chocolate are big hit with me too and must be on the brain lately as I just put up a chocolate strawberry tart. I would have never thought to call ice cream “party balls” but I LOVE it. Very clever. Calling them party balls was a last minute idea. It’s hard to convey the whole idea in 50 characters or less! Same thing happened with my corn (-less) tortillas. When I called them almond tortillas, people gave me weird looks. LOL. You ask what could be better than that?? NOTHING!!! I’m so excited about this recipe – a healthy ice cream recipe with all my favourite ingredients. I’m in heaven! So glad to find you blog – visiting from The Yuck Stops Here. 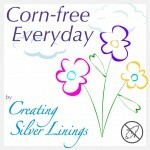 Thank you for this recipe and the information on eating corn-free. I’ve just recently started to explore corn-free, non-GMO and organic foods. It’s nice to see yummy looking recipes that are good for you. Thanks again! Welcome to the corn-free club. We’re a small but growing community! Thank you so much for sharing this delicious ice cream with Foodie Friends Friday Party this week. I’m always looking for ice cream recipes that are dairy free. Will definitely try this. Pinning and sharing. Brilliant idea to freeze ice cream balls for a nice presentation! And with such an incredibly delicious sounding recipe. It never occurred to me that grain sweetened would mean corn sweetened. Of course it makes sense now. I’ll have to keep an eye out! Do you know how can i prepare this recipe if i don’t have an ice-cream maker? There are numerous ideas around the web. The one that makes the most sense to me is to freeze the ice cream base (without the mix ins) in ice cube trays then process it in a blender. If you don’t have a high-powered blender like Vitamix, I would freeze 2/3 of the ice cream base and leave the rest refrigerated. That way when you blend, it will be easier on your blender. I would then stir in the mix ins by hand. The texture should be very close to soft-serve. Store in a freezer container. Thanks for bringing this up! I’ll add it to the post for others. We will just love this combination for your Strawberry Chocolate Ice Cream. Thanks so much for sharing this awesome recipe with Full Plate Thursday. Hope you are having a great weekend and come back to see us real soon! These look so tasty! Berries with chocolate sound like the perfect combination. Thank you for linking up to The Creative Exchange. Featuring this as my favorite for this week’s Delicious Dish Tuesday! Thanks for linking up last week! Can’t wait to see what you bring this week! Thank you so much! I’m honored that you chose my recipe. This looks great! Thanks for sharing at Savoring Saturdays! Strawberries and chocolate – yum! I bet the nibs add a nice texture too. 🙂 Thanks for stopping by and sharing with us on Five Friday Finds. Hope you can stop by again this week! Even though we are heading into Winter in Australia, I may have to indulge! What more could I ask for–a homemade, vegan ice cream with my strawberry, coconut milk and best of all, chocolate! This could easily become an addiction! So long Rice Dream. Hello Strawberry Chocolate Party Balls!I am so delighted that you shared this recipe for Vegan Minestrone Soup with us at the Healthy, Happy, Green and Natural Party Blog Hop! We appreciate it!